General George Washington will appear at the Medford Historical Society on Thursday evening, Oct. 6 at 7:30 p.m., brought to life by impersonator Samuel Davis. Davis is known for his striking resemblance to the General and for his meticulous research into Colonial life. Refreshments will follow the presentation. The event will be held at the Medford Friends Meetinghouse located at 14 Union Street in Medford. Admission is free and all are welcome. Samuel Davis spent the last 36 years teaching science, but he has had a lifelong fascination with history and the American Revolution. 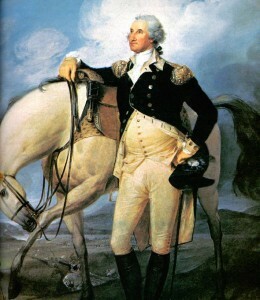 He is a longtime Freemason and a member of the Sons of the American Revolution. Sam lives in Chesterfield with his wife and daughter. For more information on this program and other historical society activities visit www.medfordhistory.org or call (609) 654–6485.